If youre into makeover games, this one will knock your socks off. And if youre not into makeover games, this one will change that! Youre the hottest new fashion stylist girl in Hollywood, and your awesome reputation is already bringing you fame and fortune! Dress up famous fashion models and VIP celebrities. Bring out their star style and give them beautiful makeovers! Create tons of incredible looks for your clients find them the perfect outfits for their big events they’ll love their new hot tops, skirts, shoes and accessories! Welcome to Hollywood the land of VIPs, where fashion rules and all the celebrities and famous models need to look amazing to keep up their star status! That’s where you come in you're the stylist to the stars! Everyones talking about the hot looks you created at the latest red carpet event (that skirt Angie J. wore AMAZING! ), and now all the girls are piling in to your stylist office for fashion makeovers! 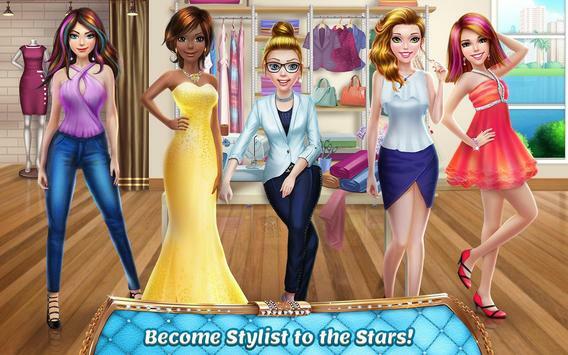 Dress up these girls and make them over, in this most fabulous of all makeover games! > Youre the next big thing stylist girl to the stars! Open up your very own Hollywood stylist office and become famous! Makeover games are the perfect way to perfect your star style. > Style and dress up your VIP clients (supermodels, famous movie stars and more!) in glamorous outfits once you choose the perfect top and skirt, add gorgeous accessories to finish off the look! > From magazine cover shoots to red carpet movie premieres, its your job to give your clients makeovers that will help them wow the crowds! > Dress up your models in fabulous clothes (dresses, skirts, shoes, pants and more) at the trendiest stores Chick Shack, Party Fever and Stardust, and add perfect accessories to complete their outfits! > No makeover is complete without a mani! Make sure their nails are perfect add cool stickers and nail jewels, and complement their manicures with rings and bracelets! Please review Stylist Girl Make Me Gorgeous! Game and submit your comments below. We will collect all comments in an effort to determine whether the Stylist Girl Make Me Gorgeous! app is reliable, perform as expected and deliver the promised features and functionalities. Stylist Girl Make Me Gorgeous!